If you’re a true blue gaming geek, then the Octane 120 arcade cabinet from Dream Arcades will definitely be the platform of choice. It is based upon a “high end gaming PC”, featuring an integrated projector that throws a 10-foot screen for you to enjoy. In addition to that, it will also boast a kegerator that keeps your beer (or other favorite beverages) ice cold at all times. 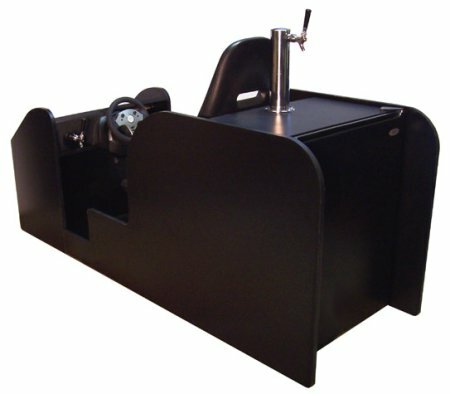 Heck, there are even a couple of taps – one located by the steering wheel with another behind for easy access to your drinks, and a cup holder by the wheel ensures you don’t have to keep on getting up to get your drink. The Octane 120 can play up to 200 licensed PC titles, PS3 racing games, and other Xbox 360, Wii and PS3 games through the included joystick. Audio is provided via a 5.1 surround sound system in the chassis. You’ll need to fork out a whopping $6,995 for this though.